Hey, there. Bruce Bradley here. It’s been a while since I’ve posted, but before I get back to blogging, I thought I’d share a little bit about what I’ve been up to, why I stopped actively blogging, why I’m coming back, and what you can expect from my blog going forward. When I started this blog over three years ago, it was all about revealing the truth behind processed foods. I had just written my novel, FAT PROFITS, and it brought to life in an entertaining fashion many of the problems with the food industry. My hope was to use my blog to help punctuate those problems with some real life examples, and get the word out about my book. After all, as one of the only former “Big Food” marketers speaking out against processed foods, I have a really unique perspective to share. But after blogging for almost two years, I was worn out. While I’m proud of the blog posts I wrote, I was drowning in gloom. Although it’s entirely possible to write non-stop about what’s wrong with our current food system, I finally figured out I’m not wired to work that way. I can’t thrive in a constantly negative world, and I was struggling. What came next, however, was totally unexpected—a series of experiences that have helped me rediscover my passion and a new way to go about sharing it! The first of these experiences happened thanks to my blog. Some folks at USAID ran across my site and learned about my passion for food, background in the processed food industry, and desire to help create a better food world. Who would have guessed this would end up being the perfect blend of experiences for an international assignment? Before I knew it I was heading off to lead a project in Serbia. For those of you who don’t know, Serbia is a fledging democracy in the Balkan Peninsula of Southeastern Europe. Originally part of former communist Yugoslavia, Serbia was torn apart by decades of war, trade sanctions, and turmoil. Much of its industry was left in a shambles, and unemployment has been very high—not a good recipe for maintaining a democracy. With agriculture being a very important part of the economy, I was brought in to learn about Serbia’s agricultural system, share global food trends, and make recommendations about how the country could best leverage its resources in a positive way to grow jobs and the economy. By the end of my assignment I ended up learning so very much about the challenges farmers face—especially in developing countries. I also made some critically important recommendations on how Serbia can leverage its strong agricultural base in this global food economy where more and more people care about real food. But unfortunately in many ways this experience hit home a painful realization that left me more discouraged than ever: right now the path of least resistance for farmers, food manufacturers, and retailers is still highly processed foods. Yes, they may be leanwashed with some marketing-hyped health claim, but they’re still highly processed foods nonetheless. Recognizing this fact brought to life that if we’re ever going to reach a tipping point in the quest for real food, we’re going to have to grow the food movement much more and broaden its reach. No longer can we afford to be dismissed as an elitist trend. Fundamentally the movement is going to have to be more inclusive, and abandon its ivory tower for good. While it’s always a privilege to share what it’s like to work in Big Food and discuss my thoughts on why we’re in the midst of a food-marketing driven health crisis, these interviews got me thinking a bit. Are the vast majority of people even listening? Or have they just become numb to all the noise in this media crazy world? And if most people aren’t tuning in, what might crack the door open for them? And that’s what brings me to the third part of my story. For the past three years I’ve been part of an amazing group of people studying positive psychology. “Positive what,” you may ask? It’s a relatively new area of study, and while the vast history of psychology dissects all that can go wrong in our head, positive psychology takes a different approach—focusing instead on what tends to make people happier and have a greater sense of well-being. What this journey has taught me about myself and how we can all make changes to live happier, healthier lives has been nothing short of amazing. And it has also given me several “ah ha” moments about why so many people may be dismissing the food movement. Perhaps one of the most valuable learnings has been around impact of shame on people. Brené Brown is a leading expert on shame and here are just a couple nuggets from her TED Talks. Shame is universal. We all have it. Shame is the fear of disconnection—the belief that there is something wrong with me that if people were to see, they’d know I wasn’t worthy. Shame is different than guilt. Guilt is, “I’m sorry, I made a mistake.” Shame is, “I’m sorry. I am a mistake. Shame is highly correlated with addiction and depression. And what does shame have to do with food? Unfortunately we live in a world where there is a tremendous amount of shame surrounding food. With staggering rates of overweight/obese adults and children, people are drowning in shame. This fact is only heightened by a marketing culture that is obsessed with unrealistic images of thin, beautiful women and muscled, handsome men. At the end of our stressful days at work and home, far too many of us end up believing, “I’m not good enough. I’m a mistake.” And one of the many ways we medicate our feelings of shame is our addiction to food. People don’t know what to believe anymore. There is so much noise out there, and they’re totally confused. While there’s a growing disgust of the Big Food companies, there’s an equal amount of distrust for foodies who get preachy or judgmental. Food has become yet another controversial topic — like religion or politics. Ordinary people are tired of the fanatics on both sides of the food debate, especially when the conversation turns nasty or disrespectful. People are increasingly skeptical of the latest fads or nutritional studies. Rather than looking for a one-size fits all approach, they’re seeking honest help and advice that they can personalize. What scares me the most from these conversations is that as people feel more ashamed, confused, tired, disgusted, and skeptical, their most frequent response is to throw in the towel and give up. Much like the apathy we’re seeing towards politics and organized religion, people are deciding food is just another area of life they’re afraid or don’t know how to navigate. And unfortunately, when every day people give up, Big Food wins since it owns the status quo. So what do I want to do? I’d like to help build a bigger tent … a more inclusive food movement. Applying Brené Brown’s insights I want to focus on empathy, ditching judgement, sharing my own struggles with food, and encouraging simple steps vs. rules and perfection. And what does this mean for my blog? Although I’ll still take on the processed food industry and it’s misleading products and marketing tactics, my website will be more focused on how I’ve created a healthier lifestyle by sharing recipes and tips. While I candidly admit I don’t lead some pristine, perfect food life, I’ve made a lot of progress on my journey. Hopefully if I share this in an honest, non-judgmental way (yes, I’ve been guilty of sounding preachy in the past), I can help inspire more people to small steps forward. I hope you will join me on this journey. While I can promise you we won’t always agree, that’s normal—it’s just how values work—no two sets are exactly alike. And as long as we agree to let go of judgement, I’m confident that together we can carve a wider path that encourages people to make positive changes and help us all create happier and healthy lives. Ready to get started? I know I am. Let’s go! P.S. If you’re interested in helping me create a blog that’s a great, positive resource for people to live happier, healthier lives, shoot me a note via my contact form. I know that in order to make my mission come alive, I’m going to have to recruit some helping hands, minds, and souls! So happy you’re back and thrilled with the new positive energy! I’ve loved your blog in the past and am excited to see this new direction. Thank you! Thanks! I’m really excited about the new direction and energy too. Let’s see where this journey takes us! 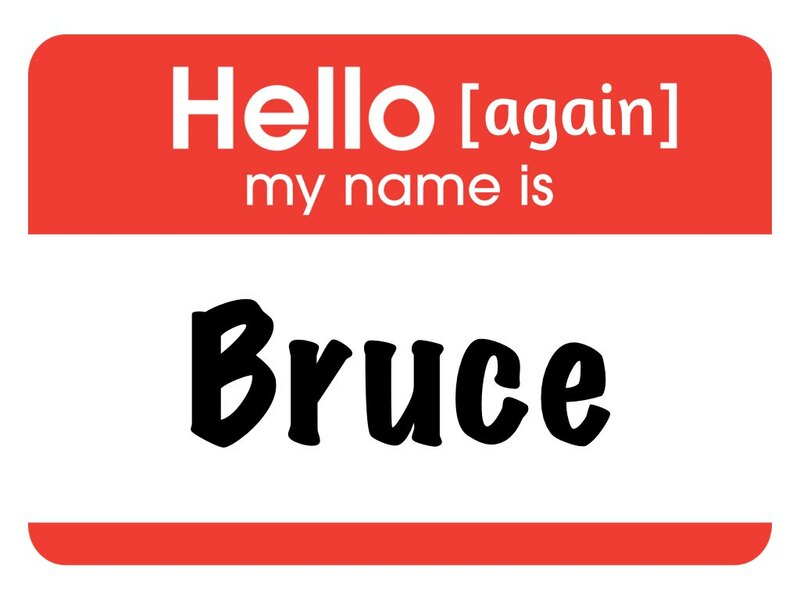 Welcome back, Bruce! Just finished re-reading your book and it was even better the 2nd time through. Looking forward to a renewed blog filled with lots of scrumptious info!!! Thanks so much, Luci. I’m so glad you enjoyed my book enough to read it a 2nd time! What an honor! Great to here you are moving on, and giving us a fresh look towards REAL food. You are right about feeling “shame and burn out” with all the “Big Foods”, pushing themselves , on kids too! Looking forward to your blogs and helpful tips, we all could use some honest clear facts and ideas for healthily , lifestyles ! Hi Bruce, nice to have you back! I am a food manufacturer – one of the ones trying to do things right by sourcing real foods that have been ethically produced, and combining them into snacks without chemical or preservatives. That’s how I initially found your site – I ran across your article about Truvia when I was researching the truth about erythritol. Anyway, I look forward to having you back and entering into some interesting conversations in your “living room”. Thanks so much Mari Ann! I look forward to seeing you commenting on my posts and sharing them with your friends and customers! Well said Bruce! I appreciate the positive approach. Life can get complicated, eating healthy shouldn’t be! We are all in this together and should be working collectively to encourage one another to eat real food. Forget shame, guilt and fear and lets focus on helping in a way that is supportive, encouraging and fun. We were created to enjoy our journeys! Thanks so much, Amy! I love your comment — supportive, encouraging, and fun is completely right! Let’s enjoy this journey! Glad to see you’re back with renewed vigor. Hope all is well with you. Thanks, Jerry. Hope you’re doing well. Thanks for coming to check out the site and my thoughts on where I’d like to take this blog! Hi Bruce, love your website. My husband has a severe allergy to propylene glycol. I have been stressing trying to better understand what is going on with our food to make better food choices for him. I’m excited to see what I will learn from you. Even though all the changes to his diet can be overwhelming I have decided to take a more positive perspective and this as a journey to eating better for us and our four children. Thank you for caring. Thanks so much for your comment, Amirh. Glad you found my post helpful and liked the positive approach. Changing our diet isn’t easy, but I’m confident that in the process of learning more about what’s in your food, you and your family will be making lots of progress to living healthier lives. Looking forward to hearing from again! I’m standing, I am clapping !!! I honor you and your integrity. How dignified, how honest – exactly what this society needs. I too am awakening to the negative spin on things, the fear, the anger, the hatred. Not what we need for a healthy mind, body and spirit. I am happy to be along for the ride and appreciate your endeavors. Thank You Mr. Bradley ! Thanks so much for your support, Jaymie. I know that together we can all accomplish great things! Looking forward to seeing more comments from you! I’m so glad that I found your blog! This is a touchy subject, but could you find a way to speak to all of the so called “mommy bloggers” out there about the downside of promoting processed food on their blogs in return for payments from Big Food, including Walmart? I understand their desire to earn money from home, but it concerns me that they are encouraging families to feed these products to themselves and their children, while denying the consequences from eating this junk to themselves and others. Your work in adapting recipes for many of the foods we all love can lead the way. Thanks for your great work! Thanks for your comment and kind words about my blog, Barbara. While I agree with your frustration, I find the best path is to hopefully inspire others. Heck, I surely can’t judge … I used to market and sell processed foods. But I do think a thoughtful, positive approach can be inspirational over the long haul, and over time it can change minds and get us all thinking differently about the food we eat.